November 6, 2018 Associate Professor Cholawish Chanlalit, M.D. After suffering a severe injury to his elbow while mount ain biking in Cambodia, David Hynes from the U.K. received emergency treatment before traveling to Thailand where he thought he would receive more professional diagnosis and treatment. However, when his injury failed to heal several weeks after he received treatment, he began to look around for a second opinion. Thanks to a friend’s recommendation, David arrived at Samitivej and has now made a full recovery after receiving the correct diagnosis and treatment. Here we look at David’s case in more detail. David Hynes was mountain biking in Cambodia when he fell off his bike and landed on his left elbow, breaking the elbow and damaging the ligaments. As his insurance didn’t cover Cambodia, David only received emergency treatment before traveling back to Bangkok to have the injury treated at a hospital. 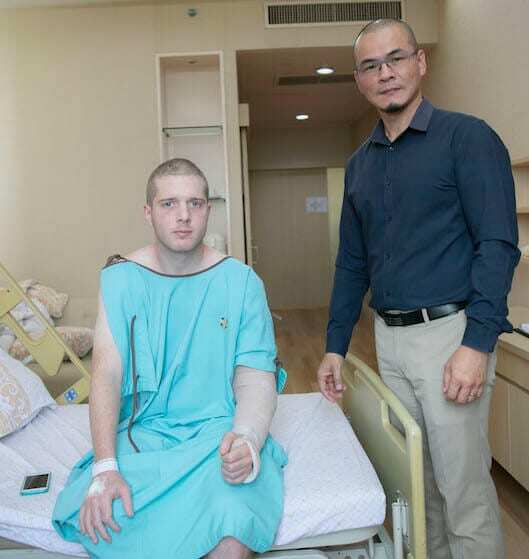 Dissatisfied with the treatment he received and worried about his ongoing injury, David began to look around for the best hospitals in Bangkok. That was when a friend recommended he should try Samitivej. Associate Professor Cholawish Chanlalit, M.D., is an orthopaedic specialist at Samitivej Srinakarin Hospital in Bangkok. Here he talks about the case of David Hynes, a patient who came to him for help after an injury he had sustained while mountain biking in Cambodia. David had failed to respond to treatment at another hospital in Bangkok. “The fact of the matter was that the tendon on the outside of the elbow was torn and the inside of the bone was fractured as well,” Dr. Cholawish explained. 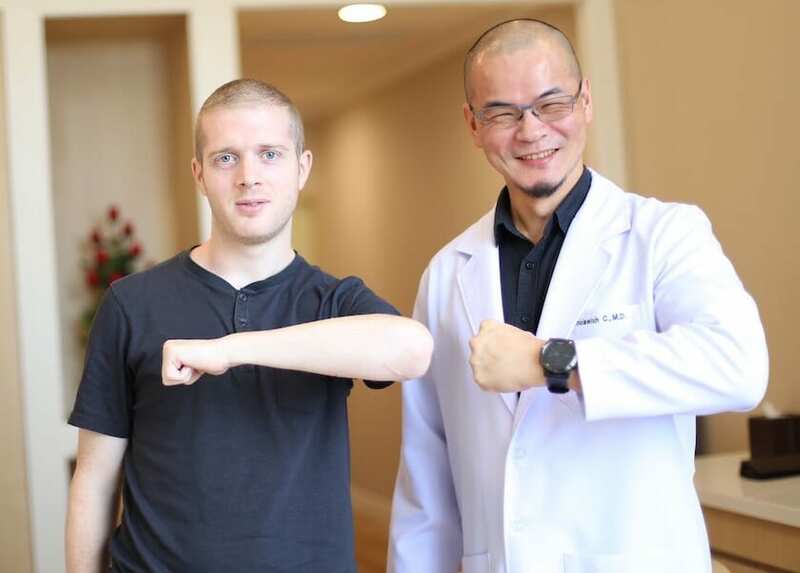 “Because of this, the elbow was not completely connected and not in place.” This type of condition, if left untrated, can easily develop into elbow degeneration. “We therefore were able to recommend the correct treatment for him—treatment which is helpful for patients suffering from elbow, shoulder or knee problems, including issues of joint space narrowing, joint hypermobility or abnormal joint pain,” explained Dr. Cholawish. These types of issues can be successfully treated and recovery is possible when handled by doctors who have expertise and experience in this specific area. As always, correct diagnosis will lead to correct treatment as. David’s issue was all down to incorrect diagnosis before he came to Samitivej.